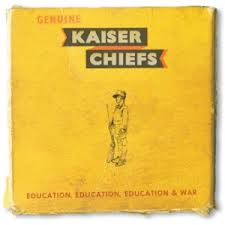 The Kaiser Chiefs have a new CD coming out next week, called Education. Tesco Direct is currently offering 150 bonus Clubcard points if you pre-order a copy for delivery on the day of release. Take a look here. The retail price is £10 although, if Tesco decides to launch it at a lower price on the day of release, you will be refunded the difference. It isn’t worth buying just for the Clubcard points, but if you were interested anyway then the value of the points is likely to make this the best deal you will find.